MMKAC used home advantage to take victory in the second Chiltern Cross-country League match. 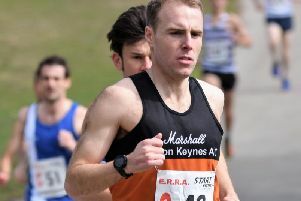 Held around Tear Drop Lakes, MK snatched a narrow overall team win over Bedford & County with a record number(128) of local competitors from the 1400 athletes who contested the 10 races. In the senior men’s race over 9500m there were no less than 36 club members from the 238 finishers. For the first time for some years they had two men in the first ten – Steve Tuttle(5th) and Liam Smith(9th). The scoring 10 was completed by Chris Hearn(20th), George Wheeler(22nd), Graham Jones(26th), Steve Green(30th), Charles Wheeler(37th), Mark Palser (41st), Jamie Seddon (46th) and Jeremy Boxberger (47th). Bedford just won a close fought team race. Within the age categories the Wheeler twins were 2nd and 4th in the M20 group, Kevin Smith and Paul Mason placed 6th and 9th respectively M60’s with Steve Herring 10th M40. In the ladies race(6000m) Lara Bromilow again led the MMKAC team home with a strong 4th position and backed up by Elle Roche(12th), Nadine Lewycky(16th) and Gemma Childs(27th) they were very narrowly beaten by Windsor in the team event. Debra Brent placed 6th F45. There was a team win for the under15 girls who raced over 3600m. They placed their scoring foursome in the top 14 with Enya Deysel(5th), Montana Edghill(9th), Gemma Milne(12th) and Jessica Nuttall(14th). For good measure Libby Herdman-Smith and Holly Jamieson were 15th and 18th. The under 13 girls(a course of 2700m) placed 3rd with Barbara de Koning(4th), Charlotte Underwood(9th), Imogen King(15th)and Chloe Munroe(28th). The u17/20 ladies(5000m) also finished 3rd and again Emma Mears(5th) led them home with Rhona Grant(18th), Sophie Botham(19th) and Charlotte Moyse(25th). Jack Meijer was the best placed MMKAC individual with his 3rd position in the under 15 boys over 4400m. He was well backed up by Robert Hickman(9th), James Dowsett(12th) and Marcus Lovell(18th) for another second team place behind Windsor. Both their other scoring youngsters teams finished 3rd on the day. The under 17 men raced over 5800m and got their scoring team in the top 20, Alfie Yabsley finishing 6th, Conrad Webber 10th, Dan Hynes 17th and Ewan Forsythe 18th with new signing James Minter 20th just missing out. The under 13s (2700m) produced a tight finished as Jack Sharp(9th) just held off a fast finishing Alex Brent(10th). Aidan Murphy(18th) and Ben Green completed the scoring team where Chiltern Harriers were winners.